The Conversion Software Registry (CSR) is a registry of software indexed according to the file formats they are capable of opening and saving. The CSR complements file format registries (such as PRONOM and GDFR) and addresses a need to identify software capable of carrying out specific data conversions without having to obtain the software first. Motivated by the NCSA Polyglot project and its reliance on software reuse servers the Conversions Software Registry was created as a repository for the information needed by Polyglot about what 3rd party software applications existed and what input and output formats they supported. The CSR is an publicly accessible online database where registered users can contribute information and anyone can view information. The CSR site provides services for a) finding conversion paths between formats, b) uploading information about the 3rd party software packages and file extensions, c) uploading example files for users to test the conversions of locally installed software, and d) uploading software wrappers scripts (AutoHotKey, Sikuli, AppleScript, Python) that allow Polyglot’s software servers to automate and provide a uniform interface across 3rd party software. 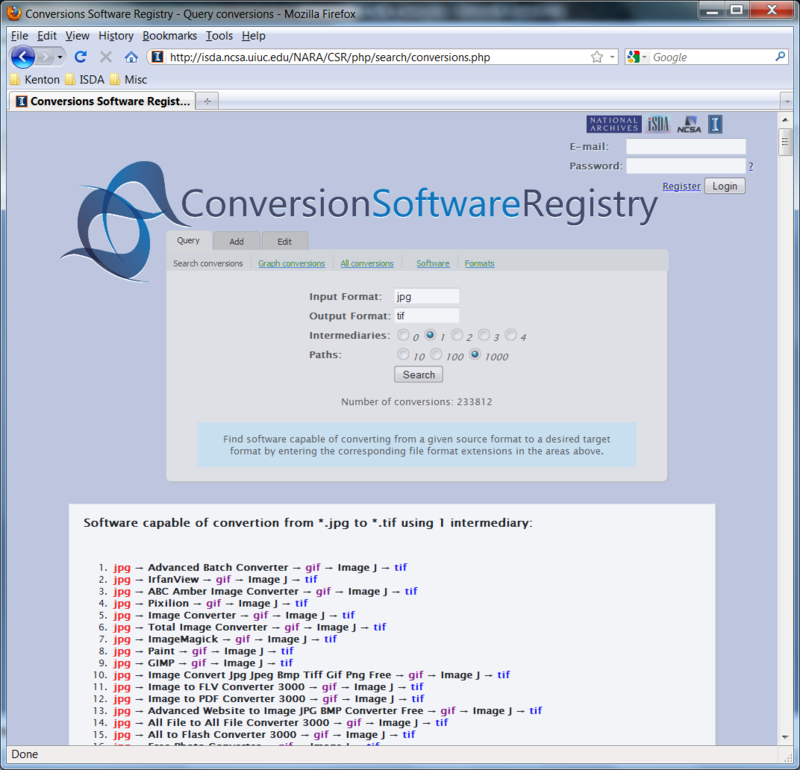 The conversion software registry web interface. Users can enter input and output format extensions in order to search for software capable of converting between the two. If the users selects to use a number of intermediary formats the search will return in-direct conversions paths, or conversion paths that involve intermediate software in order to perform the sought after conversion. This is helpful when no one application is capable of directly performing a conversion.